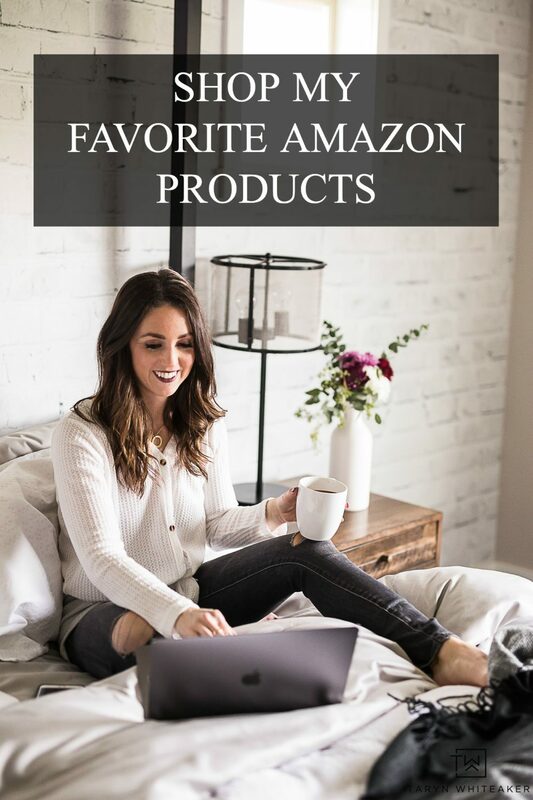 Are you visiting from Lolly Jane? So happy to have you here! I love how pineapples are the ‘thing’ of the season. They are so fun and cheerful and I’m all for rocking a pineapple shirt! A few months ago I put together this pineapple party, filled with lots of fun ideas. I loved the theme so much I decided to work it into my summer decor theme for this year. 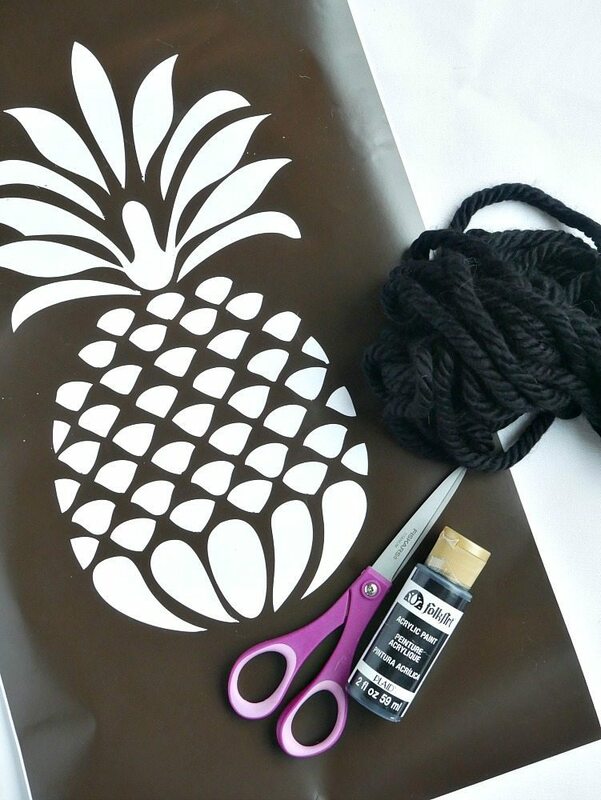 Today, I’m sharing the tutorial for this DIY Pineapple Tassel Pillow. Of course I went with black and white! I though it was a bold but classic look that would really pop in our family room. With so many neutral colors, I love how the pineapple pattern adds dimension and a little summer flare! Here i go brining out the driftwood garland again! But I seriously just love this stuff ! You guys, this is so easy to make! Can easily be done in an afternoon and even the kids can help. 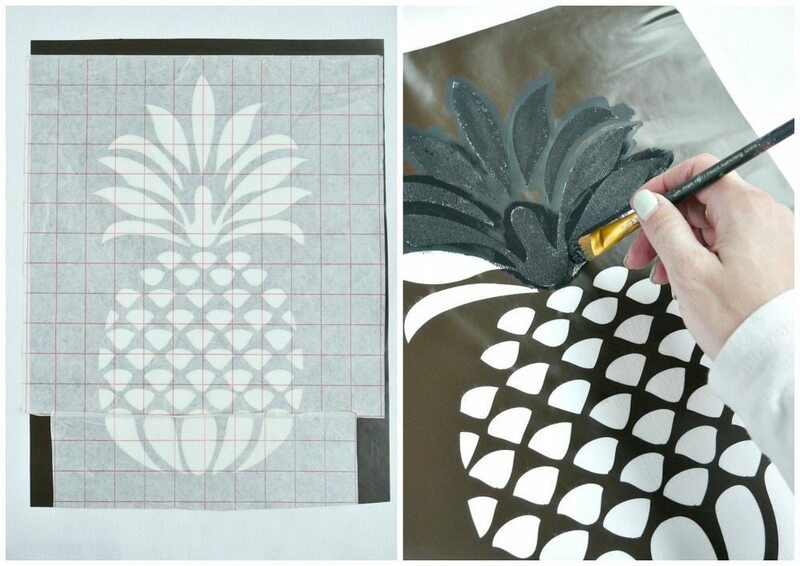 I cut my pineapple out on my Silhouette machine, I used this design. Then, I used transfer paper to help adhere the vinyl stencil onto the duck cloth fabric. Once you lift the transfer paper, give it a light coat of paint. To make the tassels, cut 12 pieces of yard at about 15″ each. This will give you those large, fun tassels! Then, take three at a time, line them up evenly and then fold them in half. Tie a small pieces of yarn about 2″ from the loop. 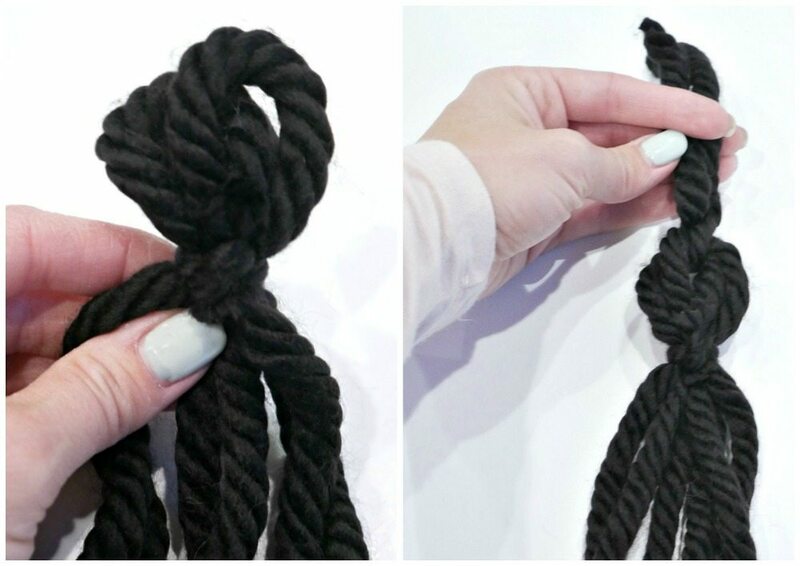 Secure it with a double knot and trim. Then, tie an 8″ piece off yard on the top. 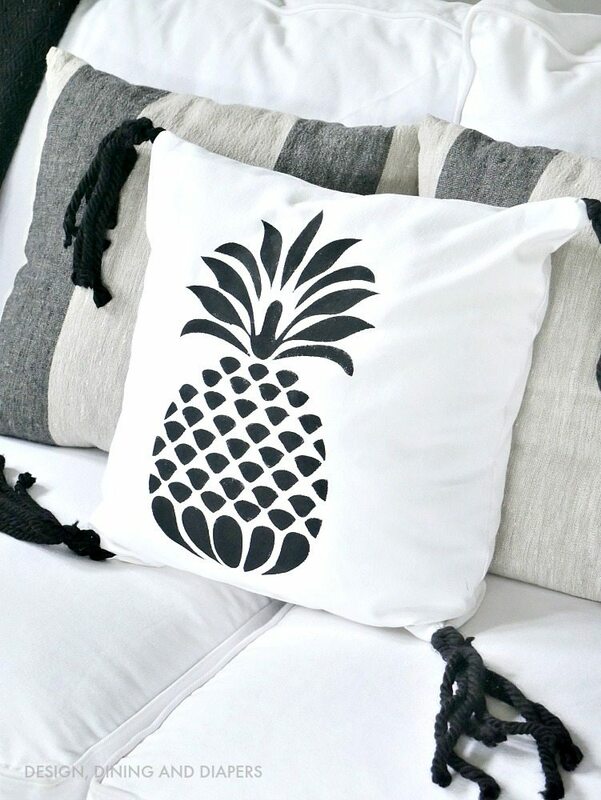 To create the pillow, place the two ‘right sides’ of the fabric together, the pineapple will now be inside, and also place the long part of the tassel inside and pin them to the corners. 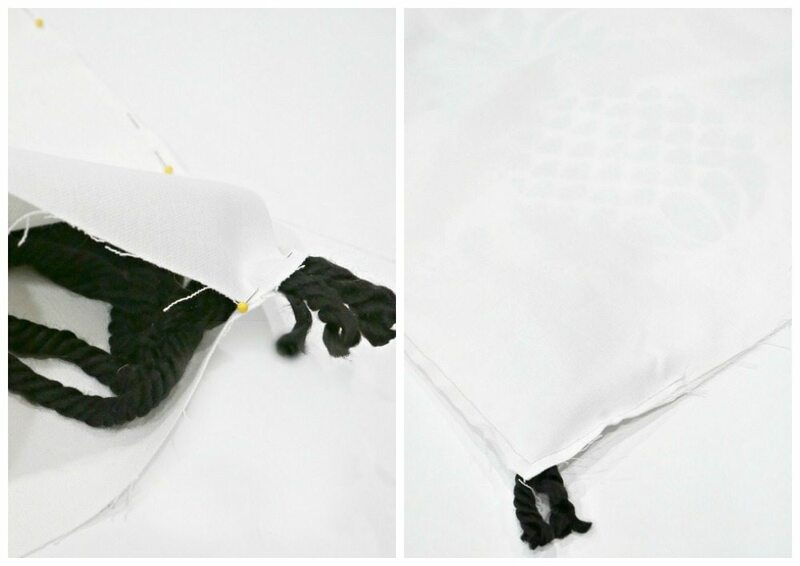 Stitch around the whole pillow but leave an opening at the bottom of the pillow for room to stuff. 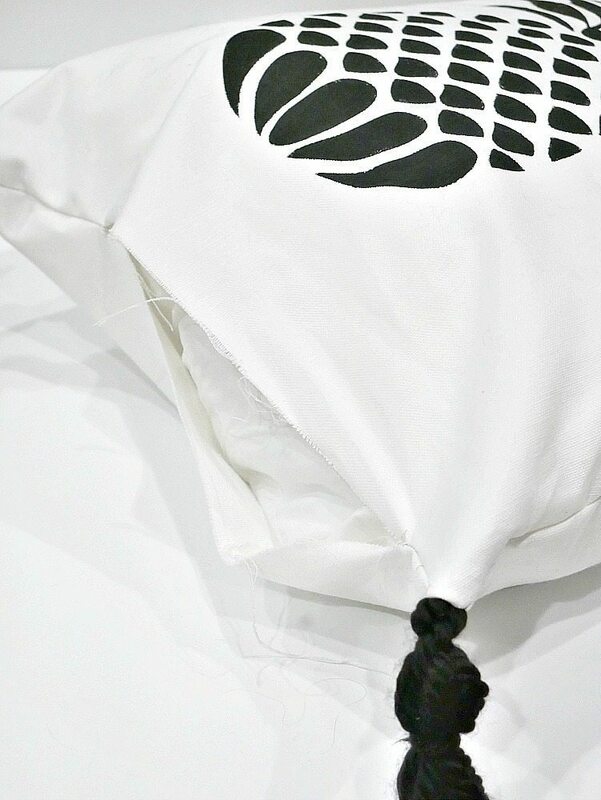 Flip the pillow cover to the right side, then carefully stitch up the opening. And now you have a fun, personalized piece of summer decor for your whole family to enjoy! 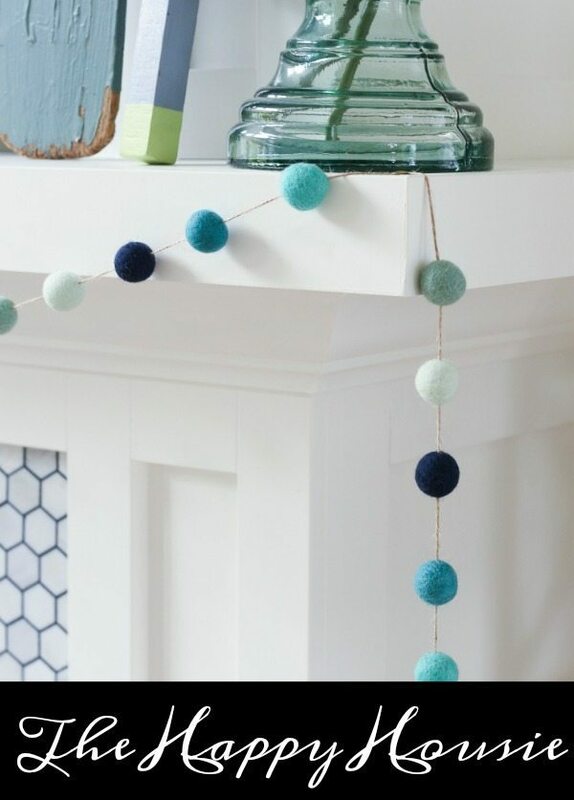 Now, if you are ready to tackle another simple summer DIY project, check out this adorable blue felt pom pomns from Happy Housie! SO cute! 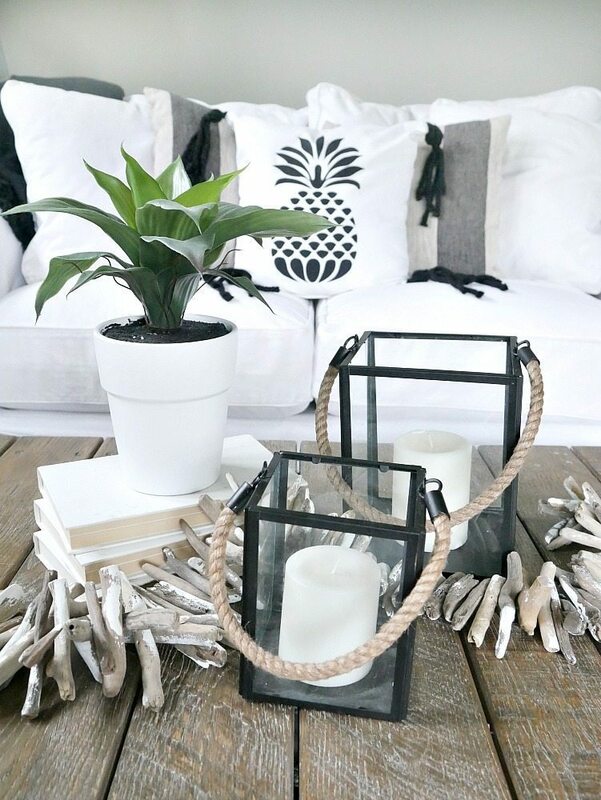 Make sure you click the link above and hop through all of the summer decor tutorials! Something to keep you occupied with all summer! PERFECT! 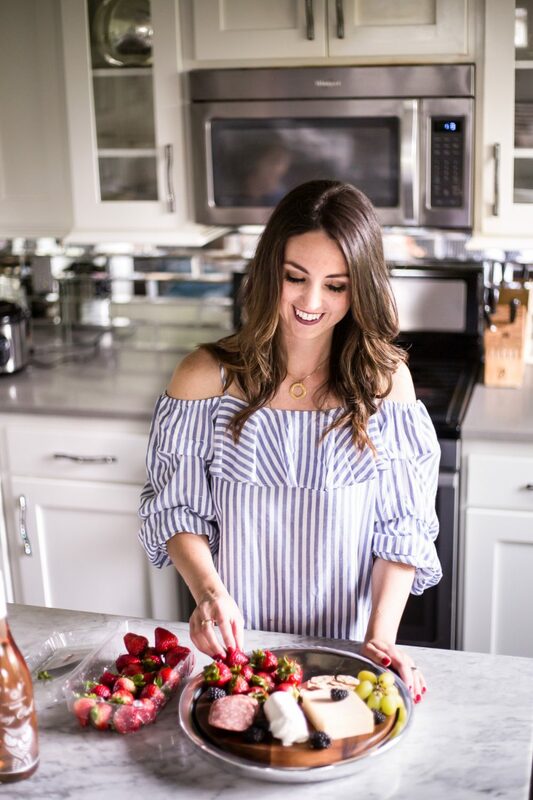 I love all things pineapple too — it’s such a great representation of hospitality. HUGS! I can’t seem to get to all of the summer projects. Can you post them? Hi Donna! All of the links should be working now, so sorry about that! This is adorable Taryn! 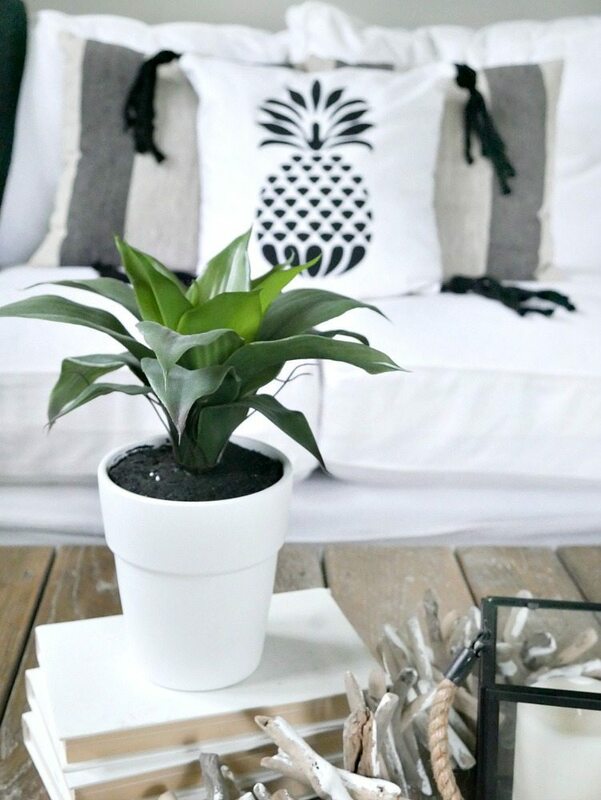 I’ve always loved pineapples, and you know how I love black and white!! : ) Thanks for putting all this together! I love it! The tassels are perfect. I can’t wait to try this on a black pillow cover I have. So cute, Taryn! Very fun! 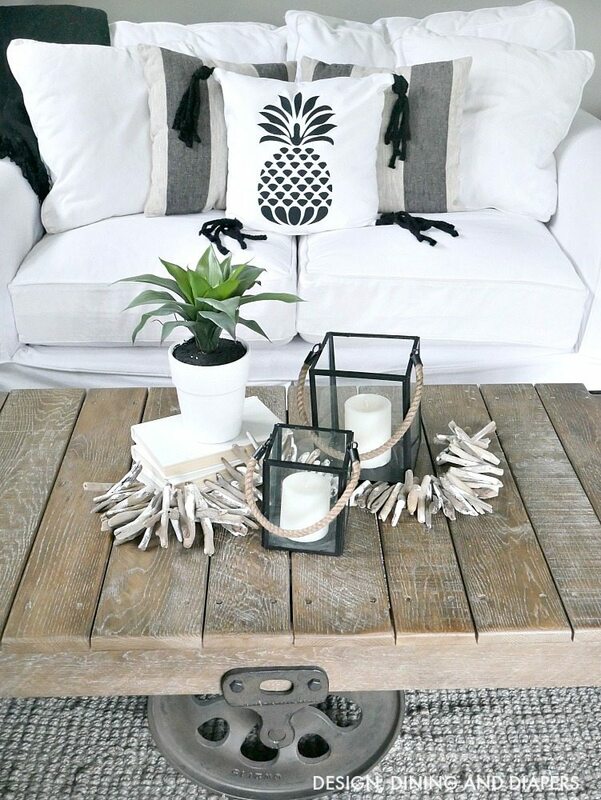 Love the tassels and all things pineapple. Visiting from Creative Collection.